They really don’t mess around after surgery. The first PT session was held in the bed, apparently after my stellar performance with the pass-out/vomit combo. They had me sit for quite awhile on the edge of the bed and finally did get me up on the crutches to walk out into the hall and back. One small step for a bionic woman! The PT, Desiree, had told us that we’d be amazed at the difference between our am/pm PT sessions in the hospital and she was right on the money. 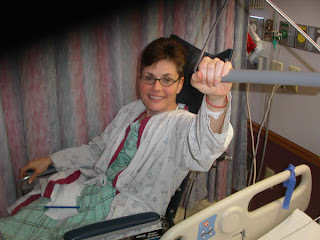 That afternoon, the day after surgery, I walked from the PT room back to my room on crutches. Granted it was very slow and she had me on the PT leash, it was nothing short of amazing. I was also shocked that I could (and apparently should) bear weight on the surgical leg. I’m also shocked that I am not in pain. I somehow expected the surgical site to be painful but there is just nothing. The only thing I’m experiencing, and it in no way rises to a level of pain, is what I’d call muscle discomfort in the surgical leg. When Renee came to check on me, she asked about my pain. I told her there really was no pain, but it felt like I had done a really intense leg/quad workout. She laughed and said, “You did have an intense quad workout, but we did it for you.” But it could not be classified as pain at all. The PCA was discontinued and I went to the oral meds, which I can’t say I need all that much. 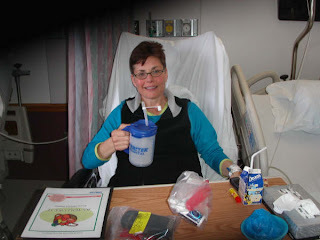 One more night in the hospital and I’m moving on the HipHab!